This My Neighbor Totoro 30th Anniversary Limited Edition features both a DVD and Blu-Ray of the film and the Art of My Neighbor Totoro hardcover book, along with exclusive postcards and a collectable coin, all in beautiful artbox packaging. Two young girls, Satsuki and Mei, have moved with their father into a new home in the country, while their mother recovers from illness in a nearby hospital. 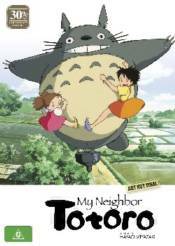 To their surprise, they soon discover that they share this home with some rather unusual creatures and even stranger neighbours - forest guardians that the girls dub Totoro. When trouble occurs, their new friends will help them rediscover hope.